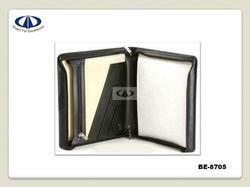 Pioneers in the industry, we offer executive file folder from India. Our range of Full zip leather Folder is produced by using superior quality leather with cotton lining inside and shows amazing features. These comes with a provision for keeping writing pad on the right side while Id card, business cards and long inserts for the papers on the left side. There is a zipper on the right hand to keep your valuble documents. Packaging Details: Each pieces are packed in individual box. Each box with white label on it indicating Item No & color for reference. Master packing in corrugated box of 25 pieces in each box with packing list attested.